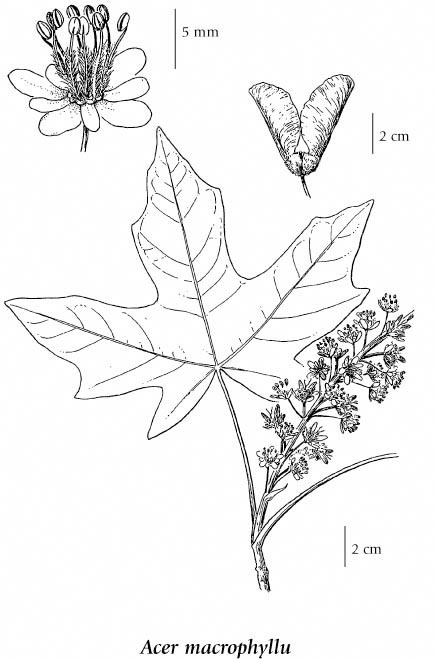 Big-leaf maple is a large forest tree that reaches heights of 90 ft. or more. It abundantly self-seeds throughout our region. Large, deciduous, spreading tree up to 30 m tall; branches greenish barked, smooth; older bark greyish-brown, ridged and often covered with lichens and mosses. Opposite, 10-30 cm wide, deeply 5-lobed, tips abruptly sharp-pointed, dark green above and paler green below, turning yellow in fall, stalks with milky juice when cut. Winged, in pairs, 3-6 cm long, yellowish-brown, hairy, pairs attached in a V-shape. Moist to mesic forests and open slopes in the lowland and montane zones; common in SW BC west of the Coast-Cascade Mountains; S to CA, disjunct in ID. A shade-intolerant, submontane to montane, Western North American deciduous broad­leaved tree distributed more in the Pacific than the Cordilleran region. Occurs in maritime to submaritime cool mesothermal climates on fresh to very moist, nitrogen-rich soils (Moder and Mull humus forms). Its occurrence decreases with increasing elevation, latitude, and continentality. Common in pure or mixed-species stands (usually with red alder or black cottonwood) on alluvial, seepage, and stream-edge sites; occasional on water-shedding sites; dominant in primary succession on fragmental colluvial soils. This fast -growing tree regenerates abundantly from stump sprouts in clearings, thus hindering regeneration and growth of conifers. Its calcium-rich bark supports well developed corticolous moss communities. Characteristic of young-seral forests.